I love breakfast food. 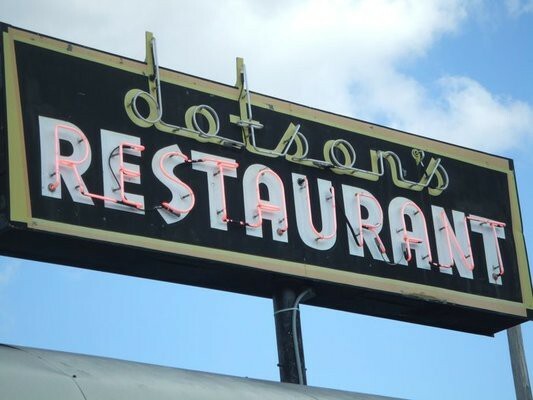 So when Mom & Dad wanted to catch a hearty meal before they headed home, I took them to a local place that my friend VB introduced to me over a year ago: Dotson's Restaurant. It's been open for over 60 years, and it's simple, delicious, home cooking. Country style! Their foot-tall pies (the meringue is incredible!) are gorgeous, but I really love it for its breakfast. We all had omelets, plus some delicious sides. The prices are great, and it's open 7 days a week. It may not look like much, but you're sure to leave happy. Don't forget to look at your menu's cover! Most of them are autographed by country stars, movie stars, and other famous folks who've passed through.